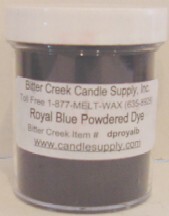 Professional strength dyes for the serious candlemaker! The purest form of dye, this is what other dyes are made from! Extremely concentrated, a little goes a LONG way! Usage can vary from as little as .01% for a light shade, to .05% for a dark shade. Melting powder dyes in stearic acid on direct heat OR adding dye into the fragrance oil prior to adding the dye to the wax can help with dispersion and help reduce un-dissolved particles in the wax.